The STEM (Science, Technology, Engineering & Mathematics) classes of Megan McMillen are intently working on a variety of exciting activities. The eighth grade is studying technology systems. They are creating their own product based on a human want or need. The main criteria of this project is to identify the parts of the system which they will label. Next the students will examine different ways their products can be manufactured. Seventh graders are studying inventions and innovations. McMillen explained that these students are currently creating digital timelines that includes inventors from four different time periods. Part of this assignment is to become familiar with “Prezi” which is a presentation program similar to PowerPoint. Further, the seventh graders are studying the characteristics of inventors, what problems their inventions solved, and how these inventions have impacted society. The sixth graders who are currently in STEM classes are focusing on what technology is and are creating presentations on different products. They are discovering various ways that products are made and for what reason. 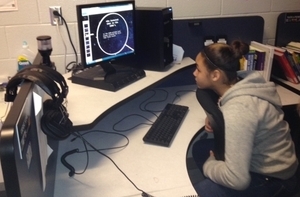 Photo caption: Seventh grade STEM student Mariah McRae focuses on her technological presentation.